Aug. 17, 2018 — It’s a lovely spring Friday afternoon in the year 1993. Frisbees are being tossed over Mac Field. Students are lounging on blankets while winding down from another rigorous week. And the soundtrack for this moment is “Music to Solve Your Rubik’s Cube,” a blend of 1980s alternative music orchestrated by Cameo Carlson ’93 on KDIC 88.5, Grinnell College’s student-run radio station. Carlson is far from alone in that sentiment. KDIC has been on the air for 50 years creating countless memories for the DJs, station managers and listeners. The format since 1968 has remained consistently inconsistent. KDIC has one- to two-hour blocks from 5 p.m. to 1 a.m. every day during the academic year. Any student, faculty, staff, or Grinnell community member can apply for a time slot, pitching any type of show they see fit. Shows have included every genre of music imaginable, along with talk shows, opinions forums, poetry readings, news reports, and a category let’s just politely call oddball. Above all, Carlson said KDIC is a station that is reflective of the student body. 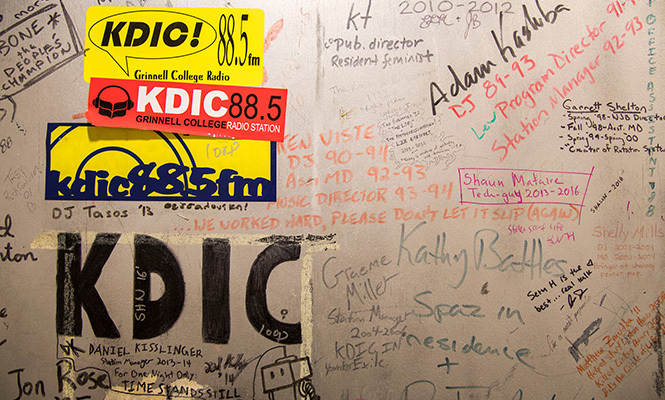 While KDIC turned 50 this year, the birth of radio at Grinnell College goes back 70 years. The College’s first radio station begin in 1948. The AM station, KGRW, lasted 13 years before obsolete equipment and electric interference caused its demise. In the early 1960s students appealed to the College’s Board of Trustees for funding so that the station could upgrade to a stronger FM signal. The appeal was denied, however, because of funding issues. For seven years, the College was without a radio station. 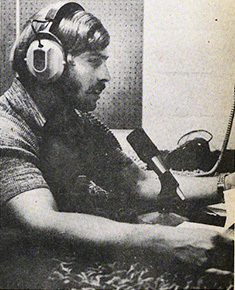 In 1968, the FM signal upgrades were implemented and on May 20 KDIC began broadcasting as a 10-watt station from the northwest corner of Darby Gym. The first six hours of programing were a soul music show with Babak Armajani ’68, a folk and rock show with Barry Ancona ’68, and a rock show with Ray Kanter ’70 and Mike Saeger ’70. Kanter and Saeger had the first of many spontaneous on-air conversations that have been heard on KDIC. Kanter recalls some of it was funny, “but other times we were probably making fools of ourselves.” The opening theme of each show was “Hideaway” by John Mayall and the Bluesbreakers, which featured a young Eric Clapton. During the first year, 85 students provided 121 hours a week of programming. The station could be heard throughout campus and Grinnell. Campus legend says some inventive Grinnellians found a way to use the train tracks as a powerful makeshift antenna for KDIC, allowing it to be heard as far away as Alabama. The story goes that the FCC shut down the station for a year in response, but FCC records do not substantiate the story. That doesn’t mean the station was without incidents in the early years. Kanter and Saeger’s time on KDIC ended with a protest walkout. When Bruce Springsteen and the E Street Band played Darby Gym in 1975, it was discovered KDIC was causing sound interference. The only way around this was to simulcast the concert, so Grinnell residents and perhaps a few drivers on I-80 who had their radios on that night heard a live Springsteen concert. Like Springsteen, Josh Burke was from New Jersey and was an avid music fan. He listened to a Seton Hall University station, WSOU, which had an all hard rock and heavy metal format. When Burke took a visit to Grinnell, Ed Zelley ’88 came to the airport directly from hosting a heavy metal show on KDIC. “The fact Ed was just a random student with a radio show opened up the possibility to me that this is something that I might be able to do to share my love and passion for music,” Burke says. studio during 1977-78 school year. Burke had a show for seven semesters at Grinnell and was station manager during his senior year. It was the first time he was in charge of people. Unlike Burke, Carlson had no idea Grinnell College had a radio station. What she did know was she was bringing 700-plus CDs with her to Grinnell even if her dad had to help lug them up to her second floor Younker Hall room. One of the first people Carlson met at the College was a woman who was very in tune with college radio and wanted to have a show on KDIC. Carlson accompanied her friend to a meeting about the station. While her friend eventually lost interest and left the show, Carlson became hooked. She continued the show solo through the rest of her time at Grinnell and obtained an FCC license. That license helped her land a job at an AM radio station in her hometown of Joplin, Missouri. She got her first job in streaming radio in 1999 with Spinner.com, which later became AOL Music, because they needed people who could program niche radio. She went on to be part of the original team at iTunes and today is president of mtheory Nashville. One of the coolest things Lydia James ’19 has stumbled upon working at KDIC is two recorded shows on cassette tapes from 1997 and 1998. While mindful of the future, James also wants to celebrate the station’s past. James, Sarah Phillips ’19, and Steven Duong ’19 served as station managers last school year and will do so again this year. Station managers do everything from cleaning and organizing to creating a budget, organizing events, and making merchandise. One of the major responsibilities is sorting through show applications and building a schedule. James said one of her goals for the year ahead is to further market the station to make sure more students, faculty, staff, and community members know it exists and that they can apply to have a show. Another goal is to create a listening room. One of the larger rooms in the station used to house thousands of CDs and records. Staff has gradually moved them to a room in the Joe Rosenfield ’25 Center (JRC) basement. “The idea is that students will have a place to hang out, do homework and listen to this huge collection of music,” she says. As KDIC enters its second 50 years, James said she doesn’t see the enthusiasm for radio programing fading at Grinnell even though it’s now considered an older form of communication. Alumni no longer need to be in the Grinnell area to listen to KDIC. Through the KDIC app on Google Play and Apple, broadcasts of the KDIC shows can be heard when school is in session. Although it’s being repaired at the moment, the station can later be live streamed by visiting www.kdic.grinnell.edu/stream.